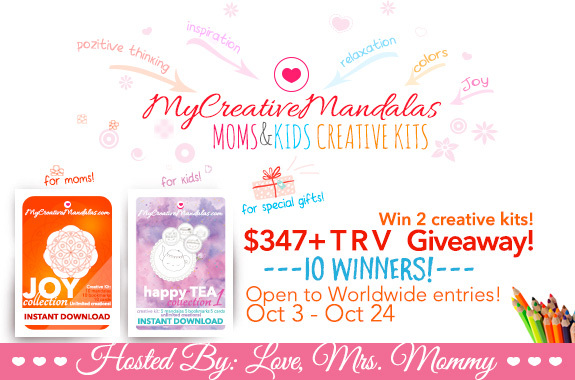 Love, Mrs. Mommy: Blogger Opp: 10 Winner My Creative Mandalas Moms & Kids Creative Kits Giveaway! $347+ TRV! Blogger Opp: 10 Winner My Creative Mandalas Moms & Kids Creative Kits Giveaway! $347+ TRV! Love, Mrs. Mommy is hosting a *10 WINNER* giveaway, perfect for the coloring and creative family! Each winner will receive a Mom and Child Creative Kit. Great way to spend time with your children! Both a Mom and Child Creative Kit including the JOY and happy TEA collections! A $347+ TRV giveaway!